Need an easy way to get CSV reports into Grow? We’ll teach you here how to automate CSV exports using Zapier to get them into Grow via either Google Sheets or Dropbox. There are two ways you can use Zapier with Grow: one is with our direct integration, and the other is by connecting it to your data source and either Dropbox or Google Sheets. This article will cover bringing your data to Dropbox or Google Sheets and connecting those to Grow. The data source you are using needs to export automatic emails with attached CSV sheets containing the data. The CSV sheet needs to be formatted such that will work for Grow. If they aren't formatted as shown in this help article, the automation will not work. A Google Drive or a Dropbox account. There are three parts to this process. We’ll walk you through each of them. Before you do anything else, you’ll need to create a Gmail account. We recommend creating an account dedicated solely to this report, instead of having it attached to someone’s personal email account. Once you’ve done that, go to Google Drive and create a sample spreadsheet. It doesn’t need to have anything in it, but name the file how you want all future exported CSV files to be named. We will use this file later to test the Zap you’ll create. In the data source, set up the CSV export so that it sends automatic emails to that Gmail account. You need to have finished the above steps before going on. If it didn’t already, go ahead and have the data source send you an email with an attachment. Before going on, the Gmail account should contain at least 1 email with a CSV attachment. Next, create a Zap. (Click the Make a Zap button at the top of the page.) Zapier will walk you through the process, and we’ll guide you with the details you’ll need enter. Select Gmail as the trigger app. Zapier lets you search for the apps you want to connect. For the Gmail trigger, select New Attachment. Once you’ve done those two things, click the blue Save + Continue button at the bottom. You will need to attach or authorize the Gmail account. Press Connect an Account and connect your Gmail account. It will ask you for permission to access your Gmail account; go ahead and click Allow. Once you’ve connected your account, press the blue Save + Continue button. It will then let you select or filter down specifics. If you have different reports coming in to this same email and will have multiple Zaps, you will need to be specific about your details. You can use Labels or String search. We prefer string search. For example, from:datasource OR subject:weeklyreportclient1. You can edit this string to match the subject line or email your report comes from. That way you can make multiple zaps for subject:weeklyreportclient2 or other things. Next you’ll continue through the steps to save and test. Make sure that the Zap pulls in the correct report from your inbox. Finally, you will set the action app to be Google Drive. Once you’ve selected Google Drive, you’ll select an action. For this one, you’ll need to click on Show Less Common Options. From the options that appear, select Replace File. Click Save + Continue at the bottom of the page. Next, you’ll need to authenticate to Google Drive with your new Gmail account and give Zapier permission to access the account. Zapier will have you fill out a template. If you are housing these CSV exports in a specific file, you’ll need to specify that. For the File to Replace field, select the temporary file you created in the first step. In the File field, use the button at the right to show the options. Click on the first step, Attachment, to select the attachment that comes in from Step 1 in the Zap. For the Convert to Document field, select Yes. Grow needs this to be able to read the document. In the File Name field, type in the name of the document that will be used for all future files. This needs to be the same name as the file you’re replacing. Make sure that it doesn’t have an extension. Finally, in the File Extension field, type in the exact same name. If the file has an extension .csv, leave it off. If it has the extension, it won’t work in Grow. You can also follow the image below to make sure you are doing it correctly. Press Continue to test the Zap. You can double check in Google Drive to make sure the correct file was uploaded. Once you have checked this, press the blue Finish button. Give your Zap a name and turn it on. After you’ve done all of this, go to your Grow account and log in. Connect to Grow's Google Sheets integration using your new Gmail account and bring in the file. It will be replaced every time the Zap runs (however frequently your data source exports the CSV). Please note that this will replace any data that was there previously. First, set up a Dropbox account, if you have not already. 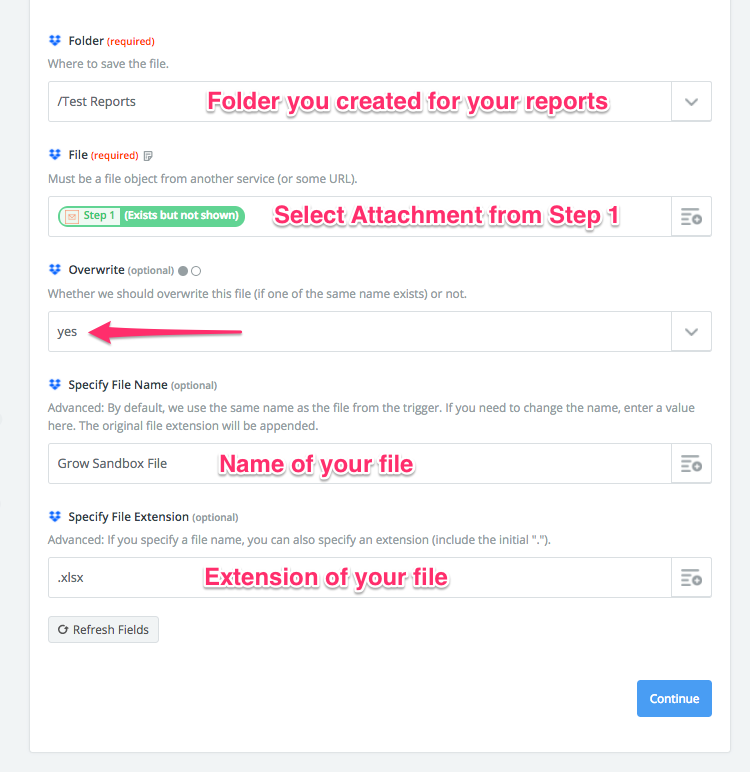 You will need to create a folder for your automated emails in Dropbox. Go ahead and name this however you want; just make sure that you will remember it later. Next, set up a Zapier account. The free Zapier account option will let you create up to five Zaps with up to two steps---a trigger and an action. (A Zap is the connection between various apps.) In this case, we will set up Email by Zapier as the trigger and Dropbox as the action. In order to do this, click on the Make a Zap button at the top of the page. For the trigger app, search for Email by Zapier. 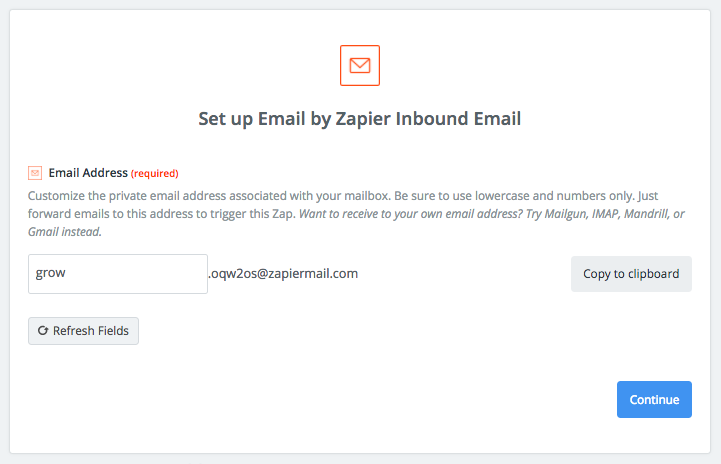 The trigger will be automatically selected for you--New Inbound Email. Go ahead and press the blue Save + Continue button. The next page will require you to create a Zapier email address. When you get reports, this is the address that you'll send them to. After you enter a custom email, you can click "Continue." Next, you'll go ahead and send an email with the report attachment to your new Zapier email address. When you've done that, click "OK, I did this." Zapier will double check that the email was sent. After testing the email, Zapier will have you connect another app as your action app. Use the search bar at the top to find and select Dropbox. 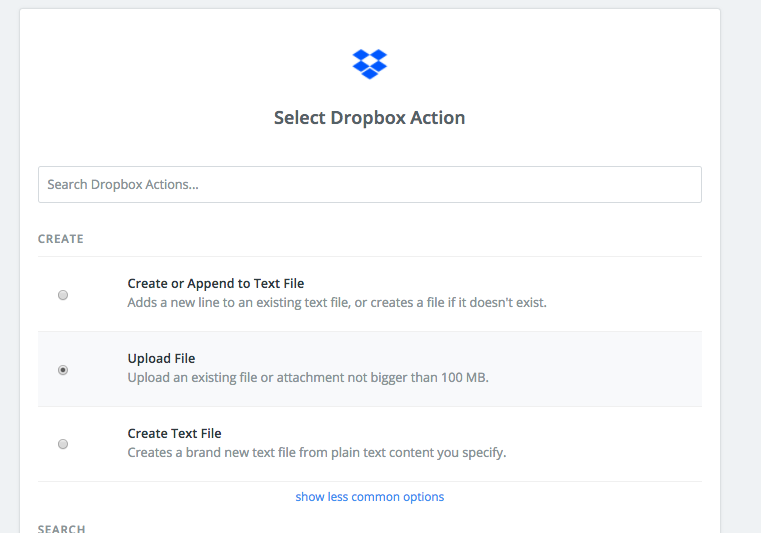 For the Dropbox Action, select Upload File and press Save + Continue at the bottom of the page. On the next page, press the Connect an Account button and connect your Dropbox account. Once you've done that, press Save + Continue. Folder: Select the folder that you created for your report. NOTE: This folder should only ever have one file. File: Click the button on the right side of the field and choose Attachment. Overwrite: Select Yes from the dropdown list. Specify File Name: Enter the name of your file, if it is not automatically filled in. You can use the image below to make sure that you have filled out the fields correctly. When you are done, click "Continue." Go ahead and name your Zap and turn it on. And that's it! Log into your Grow account and connect your Dropbox account. 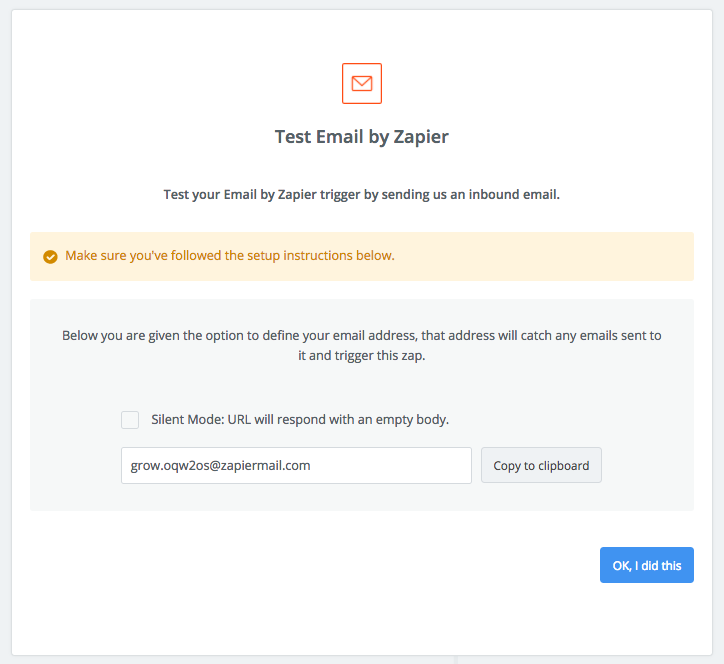 Every time you send an email to your Zapier email address, the attached document will be updated in Dropbox.